Joe Launchbury said his man-of-the-match award would not "go on the mantelpiece at home"
Rugby World Cup organisers will change the man-of-the-match voting system for the quarter-finals after some surprising winners in the pool stages. Until now, a three-player shortlist was selected by the tournament's world feed radio, with fans picking the winner via social media. 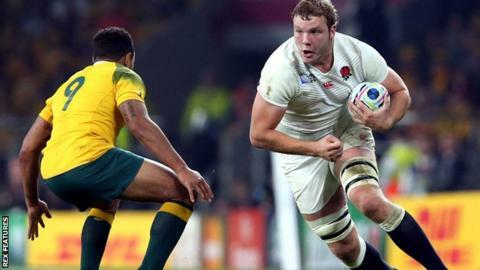 Joe Launchbury said he was embarrassed to be named man of the match for England's 33-13 defeat by Australia. "There've been a few challenges," said head of Rugby World Cup Alan Gilpin. Launchbury said "a whole host" of Australia players could have won the award after their victory over the tournament hosts. Bernard Foley scored 28 of his side's 33 points, while England coach Stuart Lancaster said Wallabies captain David Pocock was "outstanding". Lock Launchbury said: "It was embarrassing and it definitely won't go on the mantelpiece at home." Uruguay scrum-half Agustin Ormaechea, meanwhile, was named man of the match in their 47-15 defeat by Fiji having scored a try and been sent off in the space of eight minutes. "Any man-of-the-match scenario where you have a public vote and that public vote takes place at a particular point in the game leads to some anomalies," added Gilpin. "We're looking at that now before the knockout stage and the plan is for the change to be made. We're adjusting the timing and the way the voting takes place."